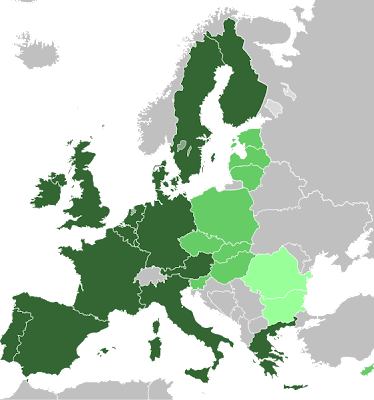 The EU gained serious traction through the late 2000s as the Lisbon Treaty was ratified and the EU's executive and legislative branches became significantly more powerful bodies than they previously were (as I've mentioned before, they begin to rival the powers of the former Articles of Confederation). But as we know, a unified European continent is verging on the single greatest threat to the US' security. Obviously, the US is relatively preoccupied in the Middle East, but it is not this preoccupation that has kept the US from pressing on the EU (certainly the US is pressing on China and Russia). Ultimately, the EU is a mixed blessing for the United States. There are some downsides--with a "united" foreign policy representative, it will be "easier" to stand up to the United States on foreign policy matters as a group with collective bargaining power (think of a trade/labor union). The EU could, as a group, threaten all sorts of nasty stuff as a whole, including pulling out of Afghanistan, or otherwise not supporting a US policy, that each state on its own would not be able to credibly do. But these downsides are mitigated by the very things that caused me to use sneer quotes earlier; the EU is not actually a terribly unified place, and probably won't be for a long time, if ever (in the US, it took over 100 years for states to shed their strong unique identities). Most EU countries have a very strong unique identity that the United States lacked when they came together, and already there is a fair amount of discord within the ranks. Italy is up in arms about an EU Court ruling over crucifixes in its schools. The UK is now majority in favor of full withdrawal from the EU (in order to protect its own sovereignty). With the Tories bound to be elected by March, this may end up happening--and if it does, countries like Poland and the Czech Republic may follow. In general, a fair chunk of EU countries would rather not give up their sovereignty and independence to the extent that the Lisbon Treaty asks them to do, even for the economic benefits entailed by the Eurozone. But in general, the idea that many countries with such disparate geopolitical interests could get along is tough to imagine. The US has the dual advantage of coasts on its east/west, and relative weakness to its north/south (a number of wars have made that the case). Unity is geopolitically sensible for the US, but the EU has very different needs on its West (where it sees relative security) and its east (where Russia looms and the Balkans remain a hotspot). Western and eastern European geopolitical interests and needs will clash in the future as Russia tests the EU, and it may fall apart as the east forms its own alliance bloc with the US and UK (NATO largely faces the same risk as western Europe decides it would rather not suffer through standing up to the Russians again). Ultimately, the EU will remain geopolitically fractured and weak. The bureaucracy of getting anything all done in the EU is horrendous, especially so for such a new institution. The EU will remain facing inward, trying to find a hopeless balance that works for everyone, instead of looking outward to challenge the US or even Russia. It will, at least, have a strong internal trade, which will ultimately be good for the US--a richer EU will mean not only more high quality products, but a bigger market to which the US can eventually export. The EU will be an irritation in America's side for a bit as the US and EU diverge on geopolitical topics ranging from the Middle East to Russia to global warming, but the EU's very structure largely prevents it or any other European power from becoming a major geopolitical threat to the US, something with which the US should ultimately be quite pleased. Things looked really good in Ukraine in 2004. I mean, really good. They do, at least, if you're America. Victor Yushchenko won the Presidency of Ukraine after a poisoning attempt on his life and a fraudulent runoff that originally gave his opponent the win, prompting massive protests throughout Ukraine known as the Orange Revolution. The West was so thrilled about it that they practically bragged about having had a hand in influencing the outcome. The West envisioned the final consolidation of the former Soviet Empire into Western hands. With Ukraine secure, Russia would lose influence over a massive population, critical breadbasket, and (most importantly), Russia's only warm-water port of Sevastopol. 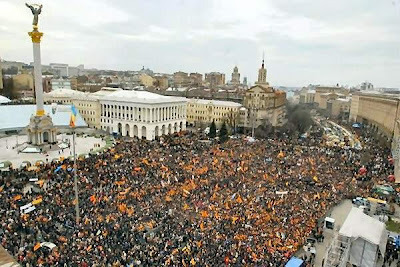 After the Orange Revolution, the West eyed adding it to NATO, and making the Black Sea a NATO-controlled body of water. Russia's geopolitical position would have been devastated--it would have been resigned to competing with China, India, and Pakistan for influence over Central Asia. But poor handling of Ukranian politics both by the US and by Yushchenko himself caused him to lose control over parliament rather quickly. Such a loss of control led, of course, to a decline in effectiveness and a further loss of support within Ukraine. NATO did not strike quickly enough. And, indeed, Russia grossly out-maneuvered the West in its 2008 invasion of Georgia, brilliantly repelling both Georgia and Ukraine's incorporation into the American sphere (Georgia's incorporation would have been similarly crushing to Russia's presence in the Caucasus. Had such mismanagement not occurred, Georgia and Ukraine may well be (unpopularly) part of NATO, much as many Middle Eastern states are US allies despite their own internal politics against it. Russia would be dealt its decisive blow into the future--it would not be an influential global power. It would have spent too long focusing on its own border, population, and food security. The inability to secure gains from pro-Western governments in Ukraine and Georgia will put the West on the defensive with respect to Russia for years to come. Russia will now look to the Baltics to further its influence and buffer--not out of malice, but simply out of geopolitical security concerns. It will be able to make Iran a continuing problem for the US, and will try to keep the US bogged down in Afghanistan. It will become the primary national challenger to the US in the next decade, rather than either collapsing irrecoverably or becoming a pro-Western liberal market country. The latter is unlikely to happen no matter its strength. Ultimately, this mismanagement was one of the biggest losses for the US, even if not among its poorer performances. The US is in the enviable position of having lots of room to make mistakes and make a mess in its foreign policy (for example, the US wins by the Middle East being a relatively divided and messy region, rather than a united anti-US force). But the situations in Ukraine and Georgia required a precision and skill that the West was not quite able to provide, and it shall pay for that lack of capability in the medium term. Last Decade Series: What Else? I've got a few more topics I want to talk about with my Last Decade series (among them will be the Israel/OPT conflict, Somalia, Sudan, Ukraine/Russia, the EU, and South America), but of course, I want to talk about what you guys want to hear about. Please feel free to take this opportunity to post a few comments about what you might like to see (or what, specifically, you might want covered in the topics already declared). Bear with me on this one, dear readers. I know it looks like things in the Middle East are pretty bad. No doubt, they're certainly not rosy. 2001 was the beginning of the US-Jihadist war--at least, it was the year the US acknowledged it was fighting the war in full. Jihadists had been preparing to try to boot the US out of the Middle East and create a caliphate for a long time, and were certainly at war with us in the 1990's. Nevertheless, things seem to have gone downhill in the last decade, but I argue that, for the most part, the US is much more secure in its geopolitical aspirations in the Middle East now than it was in 2000. In general, the United States has essentially eliminated or isolate its state-side enemies, and solidified its state-side allies. It is setting up a coalition of states to take over the "front-line" management of the Middle East, so the US can do what it does best--sit back and use military/economic spending and incentives to relatively cheaply and easily pull the right levers. Let's go bit by bit. 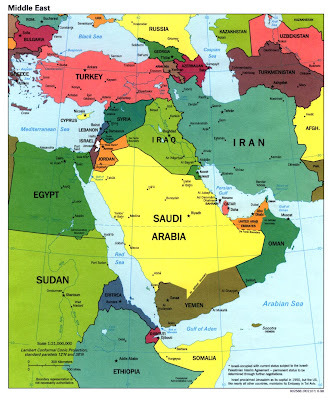 Iran: Once a very powerful influence in the Middle East, Iran has become largely isolated. Its influence has indeed grown in Iraq, but has greatly shrunk elsewhere. Syria, once Iran's pet ally, has asserted itself as an independent force, and is leaning Westward after a diplomatic push by Bush, Blair, and Sarkozy. Iran's hand in Hezbollah is much weaker than it used to be, as much of Hezbollah turns towards legitimate government. Its control of Hamas remains relatively strong, but Hamas appears relatively deradicalized--at least for now. There is little that Iran can do to grow its influence or break the influence of the US and Israel in the region, and this is in part why it has pushed so hard for its nuclear weapons program in a short time--if it can threaten nuclear deterrence, Iran can be more aggressive about pushing outward. Ultimately, its aggressive nuclear behavior has been used by the West to isolate it in its region. Even Russia and China, who see Iran as an opportunity to irritate the US, will stop short of allowing a nuclear weapons program to arise. Further, Iran's internal unrest is growing by the month, and the regime has, as a whole, lost a great deal of influence in its own borders. Iran will retreat into the future as it turns inward or goes progressive. Syria: Once one of the "junior members" of the Axis of Evil, Syria was heavily courted by the West (in particular by some impressive Diplomacy by President Sarkozy). While not a doll of the West, Syria has largely ceased to be a problem. The Cedar Revolution of 2005 mostly booted Syria from its control of Lebanon, creating a state that the West is trying to turn into an ally. Syria has further divorced itself from Iran, hoping to be a part of the Western economy rather than an ideological empire run by Iran. Frankly, this was not a difficult win. Iraq: While still riddled with problems, Iraq now stands as a relatively moderate country in the Middle East that will be able to eventually play balancing games between various Middle Eastern rivals. If the next election goes well, it will be a symbol of the effectiveness of US power and determination. Afghanistan: While certainly much farther than Iraq, the Afghani Taliban are at least destabilized and desperate; a peace deal may yet be possible. Such a deal would make Afghanistan, if far from perfect, a much more acceptable risk. The West Bank: While not quite its own state, the West Bank has grown much more moderate over time, despite Israeli-Gaza tensions and settlement/wall building by Israel in its territory. Such a moderate takeover is a significant gift to American foreign policymakers. Libya: Once a major nuclear arms worry, Libya has quieted down significantly, largely in the hopes of regaining Western investment and trade, but largely in the hopes of staying off the United States' radar. For all the apparent recklessness of the war in Iraq, the invasion of Baghdad showed that the United States was (at least under Bush) willing to ignore international opinion and bring down the hammer of regime change to any state regime that seriously threatened US interests, even with shaky evidence. Qaddafi, in one of his wiser decisions as Brotherly Leader and Guide of the Revolution (yes, that is his title), decided to voluntarily give up his own WMD program and welcome polite UN weapons inspectors into his country, rather than American Marines. Once a "junior member" of the Axis of Evil, Libya is working on turning into a major Western trade partner. Turkey, Egypt, Jordan, Kuwait, Saudi Arabia, Pakistan, Yemen: These states, while also torn internally, remain steadfastly supportive of US interests in the Middle East (though not usually out of some twisted sense of altruism). But amazingly enough, the US has managed to keep the governments of these states distinctly pro-American despite overwhelming negative attitudes among the populous towards the US. Turkey is leading negotiations with non-state actors like the Palestinians, the Taliban, and Hezbollah (and is turning into, frankly, a strange Euro-Asian state that may have influence in both areas). Egypt, additionally, is keeping a lid on Gaza while trying to help negotiate a lasting peace. Saudi Arabia has fought in Iraq and is trying to stabilize Yemen (though its pro-Sunni meddling in Iraq was quite detrimental). Pakistan is (half-heartedly, at least) fighting the more dangerous Taliban on its side of the AfPak border, eliminating key support for the Afghan insurgency. These states will continue to contribute to a regional order that will allow the United States to move further and further back from the Middle East over time. The UAE and Qatar: Worth special mention due to their (somewhat) successful adaptations of Western-style market economies. If Dubai can pull itself out of debt, these states are likely to be shining examples of how liberalism and Islam can live side-by-side (and they are unlikely to harbor anti-US terrorists, to boot). There are certainly states of worry for the US in the Middle East. Afghanistan, Lebanon, Palestine, Yemen, Somalia, Sudan, Iran, and Turkmenistan all have major internal issues that could lead to long-term negative consequences for the US, and they are worth keeping one's eyes on. All in all, the United States' geopolitical position in the Middle East is far from the sour position most Americans think it is in, even if it is indeed in a rather poor public image position. But such if how these things work. The US has managed to lever government loyalty with the right incentives, even if not public opinion with the right rhetoric and sympathy. The biggest spurt of growth that NATO experienced since its very founding in 1949 occurred during 2004, after years of intense dialogue. This growth, while not exclusively the doing of the United States during the 90's and 00's, is one of the greatest geopolitical victories that the United States has seen in the past few decades (even if the benefits have not yet been realised). 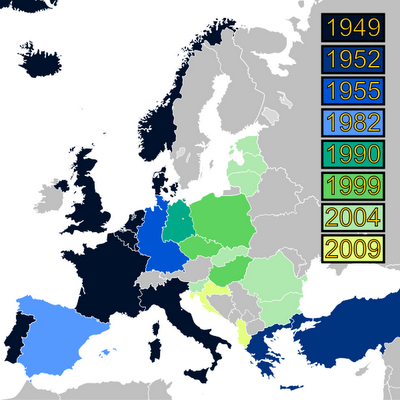 In 2004, NATO absorbed all three Baltic states (Estonia, Latvia, and Lithuania), as well as Slovakia, Romania, Bulgaria, and Slovenia. As you can see in the image to the right, NATO thrust itself towards Russia, essentially leaning right up to St. Petersburg (imagine if the Warsaw Pact had a stronghold a hundred miles from Philadelphia or Chicago). This expansion essentially means a new, strengthening front line in what is an increasingly important and difficult effort to keep the Russians locked up. In time, these countries will likely become allies as strong as Poland or the Czech Republic, allowing the United States to think about its strategic borders on Moldova and Belarus, rather than further back. NATO also gives these countries opportunities to experience economic growth with the European and American nations with whom they have grown cozy, eliminating trade barriers and creating new markets and providers. These strategic partners will grow as the United States' relationship with Western Europe grows cooler over time. As Western Europe more and more sees little need to be taken care of by the United States, it will continually assert itself (especially through the EU) towards a greater independence by pushing back against the US and emphasizing differences of opinion. With Eastern Europe set up as key allies in NATO, the United States' strategic focus will drift eastwards, focusing on Warsaw instead of Paris (the UK is likely to grow closer to the US as well, as it moves to assert its independence with respect to the European continent). But these Eastern European countries, including Croatia and Albania (which joined in 2009) will be willing and enthusiastic front-line soldiers against Russia as it tries to assert itself on the European continent and undermine US machinations there. They will enable the US to hold its strategic position in Europe via its favorite and most effective strategy--to find smaller allies and spend money on their economy and military. While folding Ukraine and Georgia into NATO would have been a nearly-fatal blow to Russian regional ambitions, the incorporation of most of Eastern Europe into NATO before Russia was strong enough to oppose it will prove to pay off major dividends into the 2020s, as Russia's military might and aggression are likely to peak. Poland and the region around it will become the key allies of the United States well into the 21st century. The United States has been arbiter of the Taiwan Strait since the final retreat from the Chinese mainland of the Guomindang (KMT or GMD). It was not until 1971 that the United States even recognized the Communist government in Beijing as the government of China (previously, the KMT government on Taiwan was recognized as government of the entire country). To be short, we've come a long way since then. And I believe the last decade marked what was, ultimately, the end of inter-Strait tensions as we know it. And the US has had a major hand in that. For Taiwan to ease up to China, a few things had to happen. One was obviously the rather overwhelming economic benefits of opening up to the Mainland. But the United States had to carefully wean Taiwan off its own dependence into an economic autonomy that drove it towards China. Similarly, the United States had to slowly decrease its military support for Taiwan, balancing a need to not scare the Taiwanese into believing they were abandoned military. And, surely, they have not been. The United States would still respond militarily to Mainland aggression across the Strait, that is clear. But the fact that Taiwan is becoming a decreasingly effective regional power has helped to assure the Mainland of its position as arbiter of all of China, whether in name or not. Cross-strait integration may not seem like a major positive, but it is, and it has been executed well. Taiwan has moved towards the Mainland of its own accord, giving no diplomatic or political bending on the part of the United States in its stance towards China in general. The US remained firm on key issues with respect to China, including trade, human rights, spying, etc. And certainly, there is no doubt that Beijing has done little to please Washington, but I intend to drive the following point: relations with China could have been very poor, and could have dominated much of US foreign policy. The defusing of the Taiwan strait tensions--probably for good--have led to a rather dramatic decline in hype over the Chinese military. Taiwan as a strategic stronghold for US naval power proved to be more a liability than an asset by the 2000s, and the gradual nudging towards the Mainland that the US encouraged proved a very long and elegant diplomatic maneuver that has saved, and will save, many headaches into the future as the US continues to deal with Russia and the Middle East as primary strategic threats. Because there is not nearly enough interesting foreign policy news going on right now (relax, folks, that was a joke), I'd like to work on a mini-series of posts about what I believe are the big-impact moves in the last decade for the United States' geopolitical position. Most serious movement in the geopolitical arena around the United States has been shadowed largely by various temporary crises, including the dot com burst, the September 11th attacks, the war in Iraq, and the Great Recession. These moves have come in the form of quiet victories and defeats alike, leaving the United States in a much different geopolitical position, and facing very different opportunities and threats, than most of the general public believes. In addition, I believe many of the threats and weaknesses that the public is aware of, it's blaming on events largely unrelated to the root cause of the situation. I seek to, in part, bring some perspective to the tumultuous decade that was known affectionately as the Naughties by many of my British colleagues, and to look into what I think is likely to happen into the Tens, and where the US is going to be headed. If all goes well, I should end up writing one short article per day for the next two weeks or so, until the series is done. Enjoy. Is Helmand Being Quietly Won? I got up today rather early in my hotel (at a job that has thus far slayed any hope of me posting, for which I apologise. I am hoping to post more) and found a newspaper, perhaps a USAToday, that mentioned on the front page a few comments by General Mills about Helmand. I've heard little else (this limited to some poking around on Google News, CNN, BBC, and Fox). Mills believes the Taliban have been all but driven out of Helmand. We're not "making progress," we've apparently won, and are now in a phase where we just have to hold and build. Though "just" may not be the right word, there. Offensives are always easier than defenses. And "building" may often mean "bribing effectively," which is not a sustainable practice. 2) it can focus its offensive attention elsewhere. The danger ultimately lies in the Karzai government once again trying to step back and let the US fight its war as Karzai's cronies line their own pockets. The Obama administration seems to have put some pressure on Karzai with its promises of withdrawal, but the pressure will have to continue. The Helmand victory shows that the US can, given time and dedication, beat the Taliban out of any province that the US is legally allowed to operate within. Superior strategy will have to dictate how the US turns such victories into long-term results.